Little, Brown and Company, 9780316278867, 352pp. The fascinating story of psychiatry's origins, demise, and redemption, by the former President of the American Psychiatric Association. Psychiatry has come a long way since the days of chaining "lunatics" in cold cells and parading them as freakish marvels before a gaping public. But, as Jeffrey Lieberman, MD, reveals in his extraordinary and eye-opening book, the path to legitimacy for "the black sheep of medicine" has been anything but smooth. In Shrinks, Dr. Lieberman traces the field from its birth as a mystic pseudo-science through its adolescence as a cult of "shrinks" to its late blooming maturity -- beginning after World War II -- as a science-driven profession that saves lives. With fascinating case studies and portraits of the luminaries of the field - from Sigmund Freud to Eric Kandel -- Shrinks is a gripping and illuminating read, and an urgent call-to- arms to dispel the stigma of mental illnesses by treating them as diseases rather than unfortunate states of mind. Jeffrey A. Lieberman, MD, is the Lawrence C. Kolb Professor and Chairman of Psychiatry at the Columbia University College of Physicians and Surgeons and Director of the New York State Psychiatric Institute. Formerly the President of the American Psychiatric Association, in 2000 was elected to the National Academy of Sciences Institute of Medicine. He lives with his wife and two sons in New York City. "Lieberman isn't another muckraker trolling the profession...Well, he may be raking up some old muck, but for good cause...he tells this history in engaging and authoritative detail." 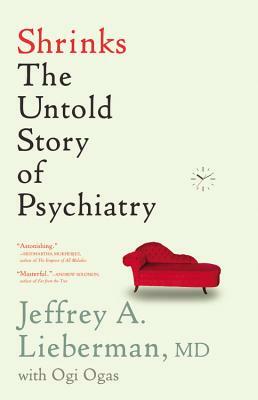 "Jeffrey Lieberman has produced a masterful behind-the-scenes examination of psychiatry--and, by extension, the human condition. A wise and gripping book that tackles one of the most important questions of our time: what is mental illness?" "An authoritative, often inspiring account of progress in psychiatry, balanced by frank and admirable openness about the field's historical missteps." "Shrinks is a great read and is highly recommended. By combining clinical case histories and theoretical musings, it describes where psychiatry came from and where it is going." "...authoritative, scientifically scintillating, and anecdotally dazzling."